As we set our sights on growth during 2012, one thing is certain: Google and other search engines will continue to update their algorithms to guarantee relevant and high-quality content appears first in their search results. To help you succeed in this changing world, we regularly adapt Skyword’s content production platform to ensure that our clients’ content meets their evolving standards. Skyword provides feedback to writers and editors to help them write with a “21st Century Style Guide” designed for search and the social web. 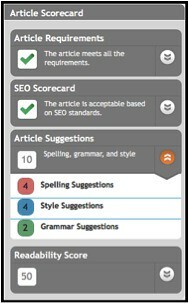 Skyword’s Article Scorecard algorithmically evaluates factors such as article and title length, keyword frequency, spelling, grammar, and style, as well as other SEO influencers, to rate an article with a pass or fail grade. Clients can decide how to use the information; the Scorecard is customizable to allow our clients to achieve the right balance between artistic prose and search optimization. 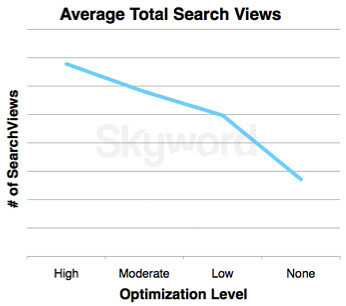 The most substantial jump in search views occurred between articles with initial (low) optimization and those that were not optimized. Articles with just basic optimization saw an 83% increase in search views over content that was not optimized. There was a 17% increase in traffic when comparing articles with low optimization to those that had moderate optimization. Articles that were ranked moderately optimized also saw an additional 17% increase in search views when compared to articles that were ranked highly optimized.